VATICAN CITY (Reuters) - South Korea's president spoke of "heart-warming" moves toward peace on the Korean peninsula on Wednesday, a day before he is expected to relay an invitation to Pope Francis to visit North Korea. 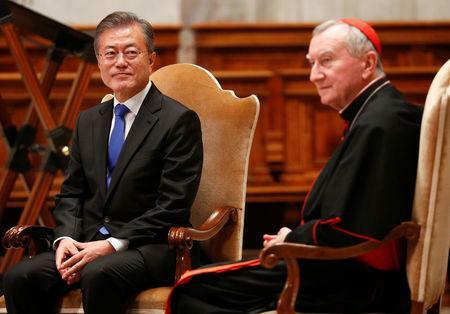 Secretary of State Cardinal Pietro Parolin, the number two in the Vatican, said a Mass in St. Peter's Basilica for President Moon Jae-in and others, including U.S. Ambassador to the Vatican Callista Gingrich and hundreds of Korean residents in Rome. After the "Mass for Peace on Korean Peninsula," Moon spoke to the congregation of recent positive meetings with North Korean leader Kim Jong Un. "Right now on the Korean peninsula, historic and heart-warming changes are taking place," said Moon, who is Catholic. "We are blazing the trail of a noble endeavor to secure peace." The two Koreas have held three summits this year. Kim also held an unprecedented summit with U.S. President Donald Trump in Singapore in June, and promised to work toward denuclearization of the Korean peninsula. Moon meets the pope at midday on Thursday and is expected to pass on an invitation from Kim. Kim told Moon of his wish to meet the pontiff during a meeting last month, South Korea's presidential office said last week. [L4N1WP2AI] The pope is expected to visit Japan next year. In his homily at the Mass, Parolin prayed for peace on the Korean peninsula. Peace, he said, had to be built on "a serious commitment to justice and solidarity, upon the promotion of the rights and dignity of the human person." North Korea's constitution guarantees freedom of religion as long as it does not undermine the state. But beyond a handful of state-controlled places of worship, no open religious activity is allowed. North Korea, which Church officials estimated had a Catholic community of about 55,000 just before the 1950-53 Korean War, does not allow priests to be permanently stationed there. Information about how many Catholics are still in North Korea is scarce. Religious agencies have said they number from the few hundreds to about 4,000. The Church estimates that 11 percent of the South's population are Catholics.